Jose Canseco To Shania Twain: Want To Get Married? Jose Canseco is single and on the prowl. The former baseball star and his ex-fiancee Leila Knight split up recently (allegedly after he threatened to kill her and her mother) and it looks like he's seeking to bounce back. So what does he do? He turns to Twitter to propose to Canadian country singer Shania Twain. And embarrasses himself in the process. The tweets in which he proposed to the "Man, I Feel Like a Woman" singer disappeared from his account, but not before they were screengrabbed by other users. 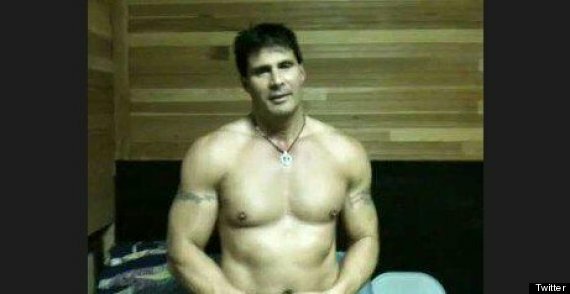 Canseco then tweeted this shirtless photo at her. Canseco is out of luck as far as Twain is concerned; she's already married to Frédéric Thiébaud, the ex-husband of a best friend who allegedly had an affair with her own ex, music producer Robert John "Mutt" Lange, People reported. Twain and Thiébaud appeared happy together a year ago, when they were spotted at the National Final Rodeo in Las Vegas, The Daily Mail reported. As for Canseco, we're used to seeing bizarre behaviour out of the former Blue Jays and Oakland Athletics slugger, but lately he seems to be outdoing himself. In late October, Canseco's ex-fiancee told TMZ Sports that he had shot his middle finger while cleaning a gun without knowing it had bullets in it. He later said on Twitter that the finger fell off during a poker tournament and announced plans to sell it on eBay. Twain hasn't responded to Canseco's proposal on her own Twitter account. But we're pretty sure he doesn't impress her much.